If you’re a business owner, you know how important the holiday shopping season is. It's that time of year many owners, especially small business owners, make the most profit. However, many struggle with how to attract customers to their store when it seems every business is working too hard to attract customers. At ChristmasDesigners.com, we understand the need for quality commercial Christmas decorations that will help you stand out and get noticed above the noise of aggressive holiday marketing and help consumers notice your business. We carry a range of beautiful and eye catching holiday decor. Whether you’re looking for LED Christmas lights, wreaths, trees or 3D dimensional Christmas displays, we have exactly what you need to help your business stand out during the holiday shopping season. Wreaths are a great way to attract customers. From traditional to unique styling, pre-decorated, lighted and unlit, and small to large, we carry a wide variety of wreaths suited to your style. Wreaths are eye catching, classic symbols of holiday spirit. Best of all, they draw attention to your door. Don’t limit wreaths to the door, however. Wreaths can be hung from lamps on the sidewalk, fencing around your storefront, front display windows, interior doorways and fixtures or even chandeliers and service counters inside the store. Be creative on where to put your Christmas wreaths to really attract customers attention. popular holiday decorations for 2018. Wreaths come in a variety of sizes. The most common are 24” up to 72” in 12” increments. For those really big areas, consider purchasing one of our giant wreaths up to 12' in diameter. Along with Christmas wreaths, garlands and sprays are valued for their versatility and charm. Garlands come in a variety of greenery types as well as different thicknesses. The most popular commercial garland diameter is 14” but for larger applications, consider going up to an 18” diameter garland. Garlands are perfect for counter decoration, doorway swag, railing draping and wrapping support poles. Sprays offer an alternative option for wall decorating and doors interior and exterior, allowing business owners to create visual interest beyond wreaths. Try staging them near items you want to draw attention to in your store. 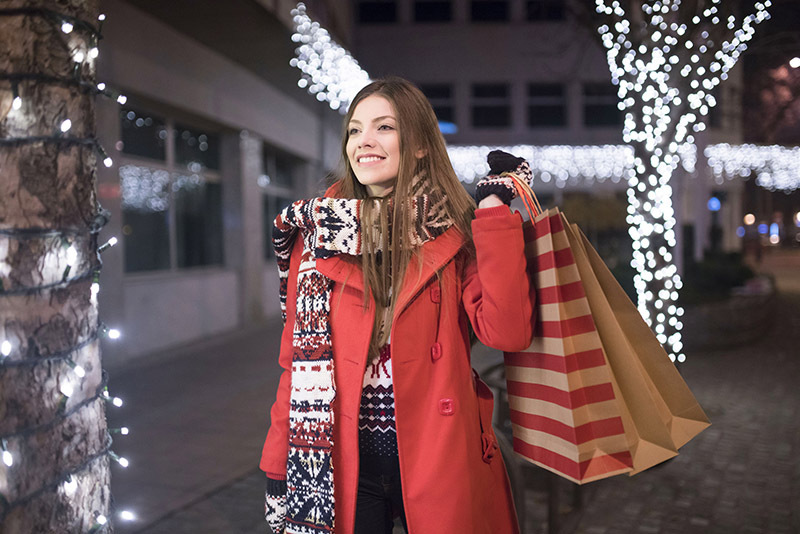 If you don’t have the benefit of foot traffic directly in front of your store, you don’t have to miss out on decorating to attract customers. ChristmasDesigners.com carries a broad array of sign enhancers designed to be mounted on your streetside display. All are brightly lighted to maximize visibility. Our sign enhancers are designed to complement, not compete, with your commercial logo. They are easily mounted and removed without damaging the sign. From holiday bows to elegant scrolls, in holiday colors or pure white, you’re certain to find one that works to draw customers to your business this season. Some businesses don’t feel ready for the holiday season without a Christmas Tree. Whether it’s a smaller scale tree for a personal site, or a larger scale for a community wide project, ChristmasDesigners.com has the tree you need. We carry traditional and animated LED trees to finish your decorating. We stock tower trees ranging in size from 12’ to 50’. Looking for something to help you stand out even more? Consider a fully animated RGB Commercial Christmas tree. Taking your tree to the next level with RGB animation is sure to be a major focal point and these days they create great social media destination centerpieces. Watch people as they line up to take photos with friends and personalized selfies and then tag themselves right in front of your business. What a great marketing avenue! Commercial Christmas displays come in all shapes and sizes. From small snowflakes to 18’ walk through ornaments. If you want to spend $500, there’s options for you. Have a big budget and looking to spend $20,000+, there’s options for you as well. With such a wide range of price levels and design options, your only limitation is your imagination. More recently European inspired dimensional displays have begun to make their way into the U.S. market. This has brought a lot of fresh designs that have been a welcome change to the traditional Christmas pole decorations, 2D silhouette displays and tired looking cross street decorations. LED Christmas lights are a great choice for any business wanting to decorate for the holidays. While many displays can be very expensive, adding a handful of LED light sets is a great way to get potential customer’s attention, even with a small budget. Dress up trees in front of your building with trunk wraps and foliage scatter lighting. Create impressive curtain lights in front of your business or behind window displays. Create overhead illumination by using bistro style drape lighting. Thanks to advances in LED technology, Christmas lighting has never been so reliable, safe and affordable. Take advantage of this low cost method of dressing up your business. The importance of decor for your commercial venue or business is obvious. Decorating helps to increase customer traffic as well as establish a repeat customer base due to establishing a sense of community between consumer and business. Increases in sales and higher visibility can lead to great profit potential. We hope that you have enjoyed these tips on utilizing commercial Christmas decorations to help your business increase your sales and profits over the holiday season, and look forward to helping you achieve your decorating plans for your sites. Please visit ChristmasDecorators.com for all your commercial decorating needs.